Michal and I always marvelled at people going on trips, journeys and expeditions and making it unnecessarily complicated for themselves by bringing equipment that isn’t up to the job. Unsuitable clothing, too thin sleeping bags, tents that do not withstand winds, the list can just go on. Of course, we have had some experiences, when what we had with us turned out not to be as perfect as promised, but usually it could have been sorted just fine. I have spent five days last week kayaking in the Kechamak Bay just on the other side of Homer. I packed all my expedition stuff, rented a funky red plastic kayak with rudder, and bought a tent, as we only had one on the peninsula, and it was Freya’s. I had a bit of a pause for thought when I saw its name: Greenhorn. Is that a good idea to rely on something called Greenhorn? Perhaps. Water taxi took me across the bay and dropped me off in Jokolov Bay early in the afternoon, it was sunny and warm and I kind of just floated with the tide until it brought me to Kayak Beach, two hours into my first day I had enough and decided to spend sunny afternoon on the beach. The campsite here had wooden platforms for tents, and food storage facilities to hide food away from bears. I unpacked my tent hoping it’s a free standing one for the platform, although it had rings all around. I started to pitch it and the reality was slowly hitting me, the tent isn’t free standing, and what’s more, it didn’t have any guy ropes. I have five nights ahead of me, with a promise of rain for the following three days. The night wasn’t a peaceful night, I allowed myself to get worried of what if, when it would, and so on. The loud noise in the middle of the night sounding like a bear didn’t help. Then while I was packing it in the morning one of the tent pole holding strap ripped out, so now my tent also had a hole in one corner. I spent most of next day paddling and worrying, looking up to the clouds and imagining the next night. Not really a good frame of mind, but fortunately the surroundings were too beautiful to allow me to keep going on like this all day. I found a place to camp for my second night. My tent was pitched on a landing of wooden stairs leading from the beach to a cabin, with an idea that bears don’t walk on stairs. I stayed on the beach to cook as the tent was too small for anything other that lying down. The rain started and I had to shelter under the bank covered by some thick leaves and branches. It was time to make a plan for the night. The missing strap was replaced by a stone inside, the tent was propped up by dry bags, I put on my water proofs deciding that if the tent gets wet through, and the sleeping bag, I may actually stay dry. No bears that night, it was calm and quiet despite the rain, and surprisingly comfortable and warm. I woke up in the morning, it was still raining, and I had to make a plan of how to keep everything as dry as possible, especially when packing without a shelter. Waking up in waterproofs proved to be smart idea, I just rolled out and was ready. Again, the branches and leaves helped. 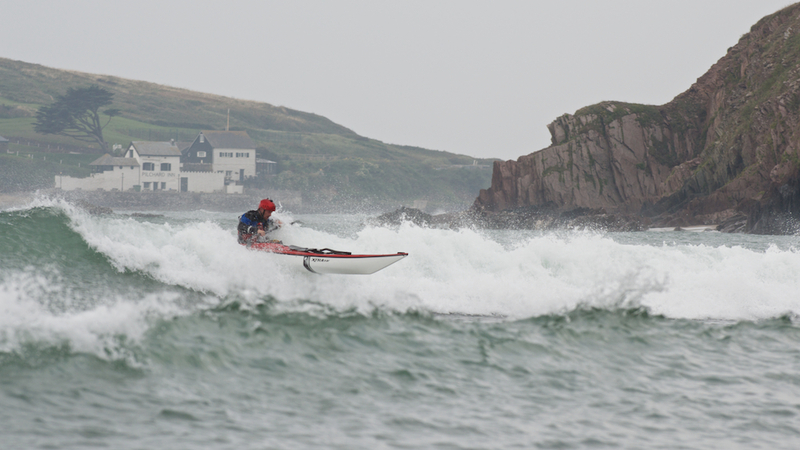 It actually went ok, and while I sat there having breakfast wearing my dry suit watching the rain I started to enjoy it. Who cares that my tent is not cut for the game, I am. Going on trips having good equipment is easy, making it work with bad stuff is a skill, or fun. Tutka Bay was beautiful that morning, sea eagles and otters for company. I paddled all day until Halibut Cove, a very interesting place of many rather eccentric looking houses. However there was nowhere to camp, all private property around here. The last three kilometres crossing was a bit of a hard work into the force five headwind. The day was exciting, and there and now I fondly thought about my little Greenhorn tent. Yeah! I couldn’t wait for the next adventure that will await us during the night. I landed on The Right Beach, and luckily there were people here. A family of grandparents, parents, an uncle, a teenager, and two little girls. Fantastic, I don’t need to camp alone. Some of them stayed in tent, the rest in a rented yurt. I was offered food, wine, berries. I pitched my tent closer to them as the bear presence was everywhere here. So glad Greenhorn and I weren’t alone. They all marvelled at the size of it. And were well impressed when just before rolling into it, I put my waterproof pyjama on. The following day, Sunday, was the forecasted very rainy one. The family was packing to go home, but before they left, they said they hired the yurt for two nights, only using it for one. And offered it to me. So I acquired a yurt for 24 hours, marvellous. 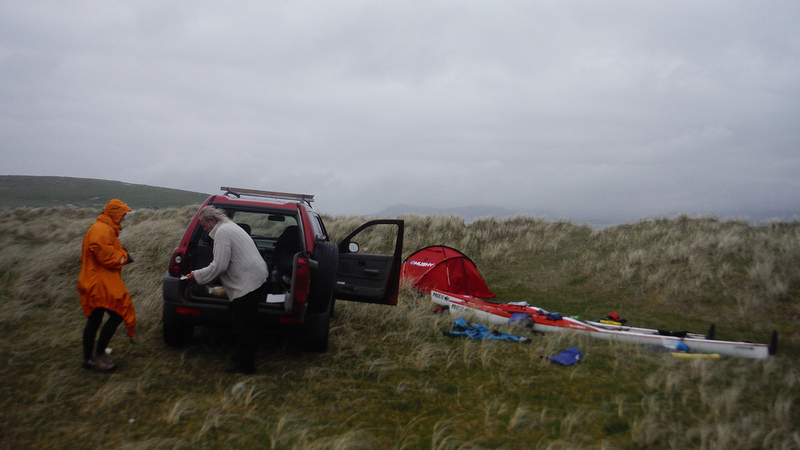 I only paddled a little bit that day as it was raining, and windy, the yurt proved great set up for book reading. Many people come to Kechamak Bay to hike to the various glaciers that are up in the mountains. On Monday I first paddled to Halibut lagoon, where entry is so narrow that it’s only accessible with the right tidal flow. It was early morning all was still but the rain, and the lagoon became a playground for porpoises. After that, I went to a place called Saddle. It’s a start of a very popular hike, so I figured out there might not be bears on the trail and I can do it by myself without bear spray and all. No bears just their poohs. I reached the Grewingk lake. There were sightings of sow and cubs during the week, but I was lucky to meet few people there. One couple invited me to walk back with them, so I didn’t need to sing and shout all the way back. I camped on the same beach as before. Pitched my Greenhorn, last time tonight. However, I was hoping for some other people to come here to not be alone. My plan B was, if I had to be alone, and the yurt empty, I would sneak in there. I stayed out on a beach for a while, and when it was finally time to go in, I’ve been inside a yurt for about 30 minutes when I heard him. A black bear was walking around, putting his head to the door, then sniffing by the window. I couldn’t take any photos as I was very close to hiding under the bed. So that’s me done with going outside until the morning. Last day, and my water taxi pick up was arranged for just after midday about 2 hours paddle away from here. 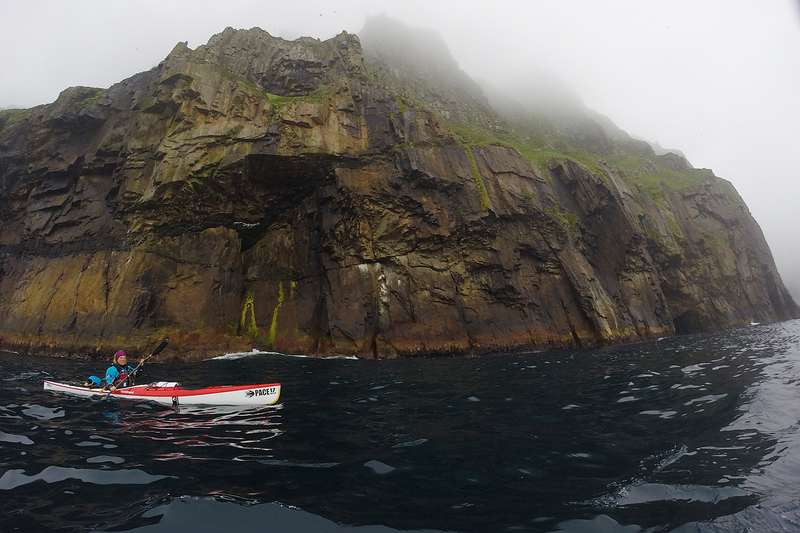 I left early, and spent some time floating around the Gull Rock watching out for puffins. Although day to day life seems to go on slowly here in Alaska, some things can change very fast, and for once, I don’t mean the weather. After three full days sitting in the Bearfoot Inn in Cold Bay all our hopes turned to Tuesday. On Tuesday the wind was meant to clam down. 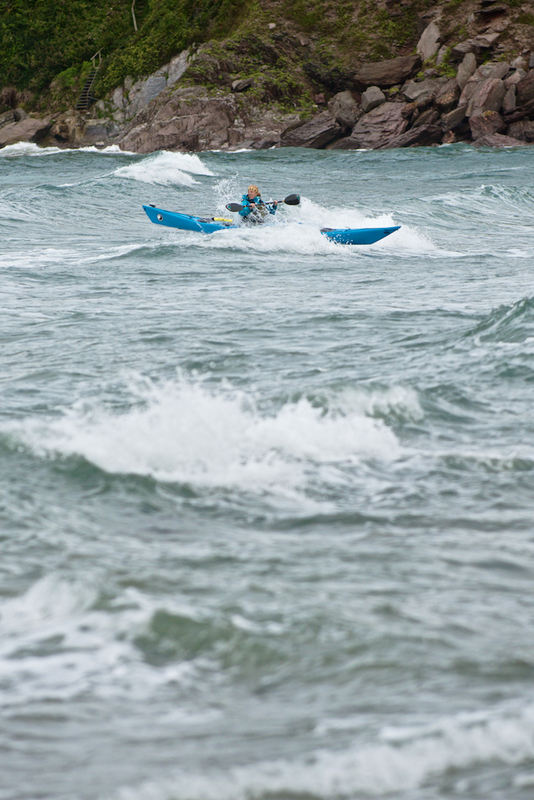 Tuesday was also the original day when Freya and I hoped to be paddling. And so Tuesday morning we went again to the airport office to find out whether there would be a plane to Nelson Lagoon. Really, we could phone the office, but since the airport was just across the road from the hotel, we decided to go there personally, same as many times in the past few days. The response was the same as we had several times this week, shrug of shoulders, nodding heads, pained facial expressions. No, it didn’t look like there would be a flight that morning. Back to the room we went, for another session of WiFiying, reading and what have you. Suddenly there was a commotion in the corridor, Freya burst in and saying that we got the phone call, we were to flight immediately. Such was our excitement that I left my bananas there, in microwave, where I stored them due to lack of space. They would be dearly missed later. However, we were flying to Nelson Lagoon! When I researched it, I found the following information: “Nelson Lagoon lies in the maritime climate zone. 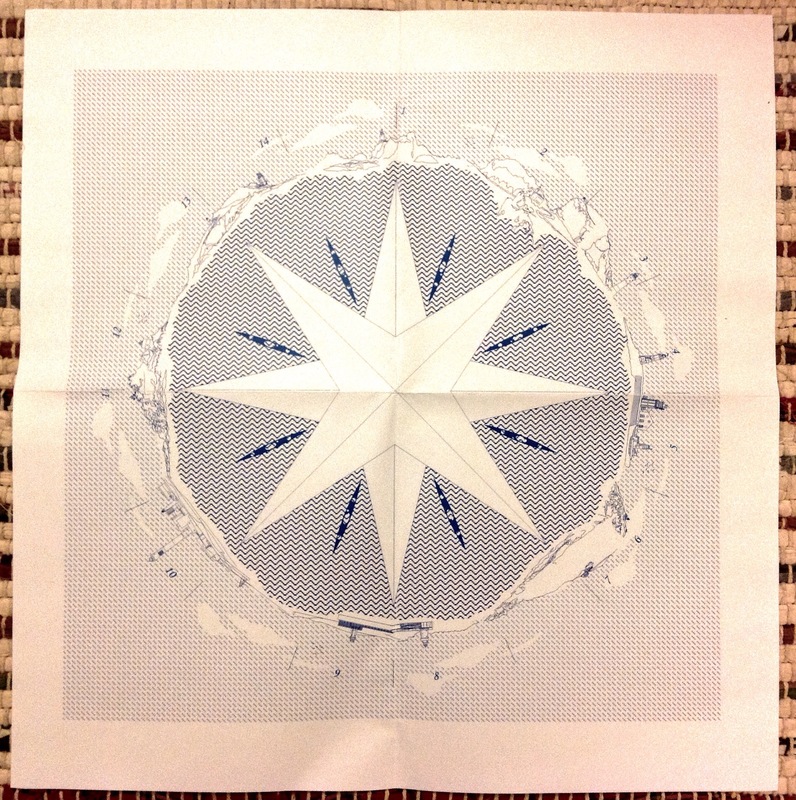 Frequent and erratic weather changes occur, with constant prevailing wind of 20 to 25MPH”. Add the period of strong wind gusts on top, no wonder it took us so low no to get here. The village is located on a long sand spit with Bering sea on one side, and lagoon waters on the other. I liked the Lagoon when we finally stepped of the plane and were driven to the village. It took a while as the plane has been the first one after few days, and the locals were all waiting for their deliveries. The place has a real village feel to it despite being fairly new, from the 1960s’, it has been the only Aleut settlement on this side of the peninsula, and in the past was used as Unangan summer fish camp. And one more historical fact from wikipedia: “The lagoon was named in 1882 for Edward William Nelson of the U.S. Signal Corps, an explorer in the Yukon Delta region between 1877 and 1920.” We met local policeman, the settlement only has 35 people living here permanently, but they do have a police man to prevent crime, mainly related to alcohol consumption. Of course my biggest interest was the school building, but it shut in 2012 as no kids live here now. 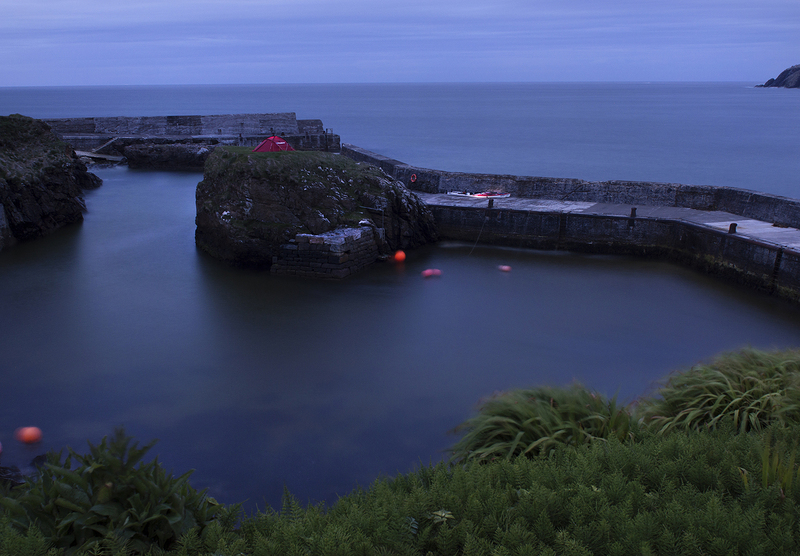 What I really noticed about the place was a lovely smell of plants, after Cold Bay, it had a real summery feel. Such, that we went for walk despite warning of bear being seen in the area. Fortunately he was seen more on the airport side, probably also picking up his deliveries, so we went the opposite direction. However most of the day was dedicated to food sorting, boats’ preparation and setting, and kit packing. We decided to take the opportunity of tiny lull in the wind and leave in direction of Port Moller on the other side of the Lagoon. One more thing was great about the place, we had a place to stay, the Bering Inn, a self catering apartment courtesy of Justine. We’re in Cold Bay, Alaska. We’ve been in Cold Bay, Alaska for three days already, still waiting for the weather to improve for us to be able to fly to Nelson Lagoon on the north side of the peninsula. This is a very strange weather bound period. 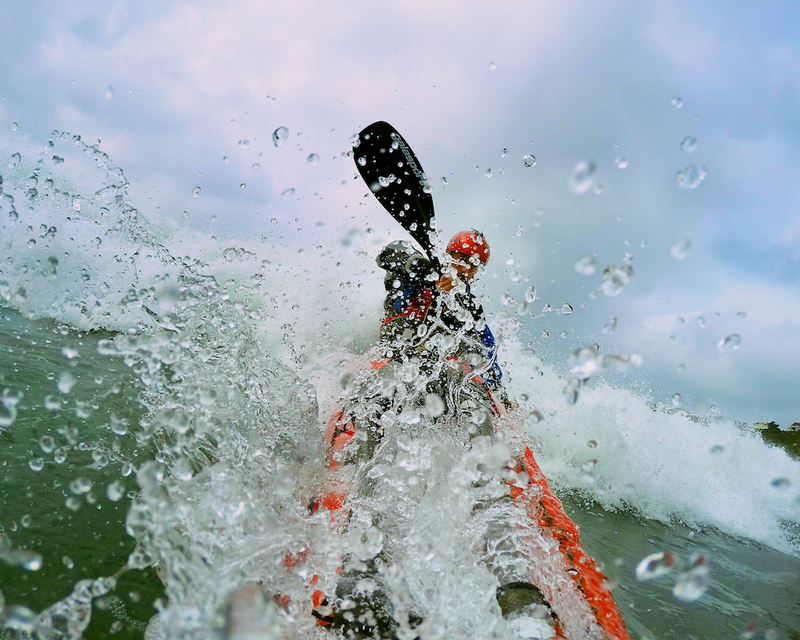 I have been weather-bound before on paddling trips. I’ve been on a multi month trip where after ten days of hard paddling in the row one was looking forward to bad weather day to have a rest and not to pack the whole circus again in the morning. 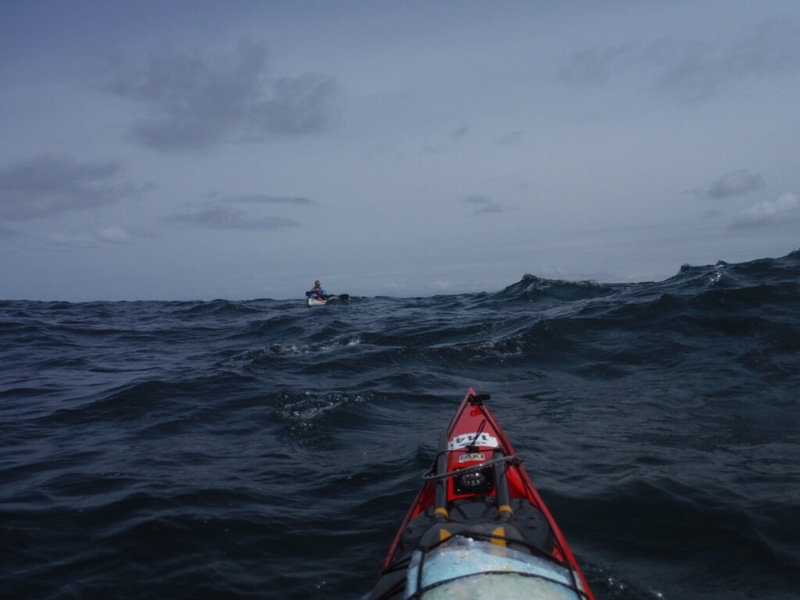 I’ve been on trips, when the weather was so bad that one was weather-bound every 2 days paddling, and had to keep good faith that the destination will be reached. I was weather-bound for few days in the middle of now where and one had to learn to entertain oneself with whatever was available. What I learnt here was to do one activity at the time to allow the time to pass easily and to stretch any distraction from waiting for as long as possible. I’ve been weather-bound for so many times within one trip that we had to change our aim altogether and learn to make the most of both the sea and the being on the land. Giving in allowed us to explore places that we would not have otherwise. I was weather-bound for so long during one trip that the journey had to be finished after long wait for the weather improvement. And while the time waiting was exciting, as we became farm hands for few weeks, the end was difficult, as we did not step out of a boat at the end, but rather of a tractor. I am weather-bound now. It’s a new one for me. 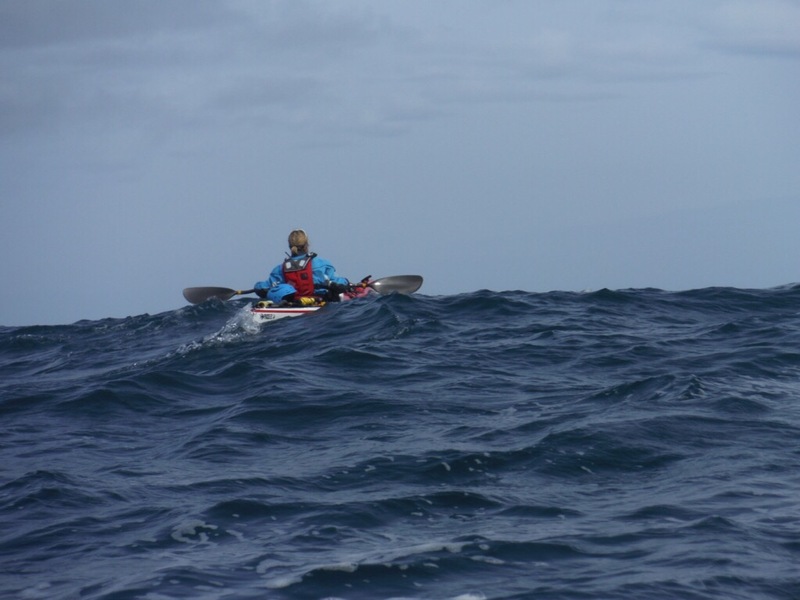 My four weeks paddling with Freya has commenced, and we are weather bound already. We haven’t placed a blade in the water, we haven’t even pack the kayaks yet. I have never been weather-bound at the start of the trip. But the feelings and anxieties are the same. Is this ever going to lift? And when it does, will there be actually any time left for paddling? How far would we be able to go? We want to go as far as possible, will we make it there? What are the conditions going to be? How do we keep our sanity and not look at the weather all the time talking numbers (Freya) and colours (me) trying to see when and how long for we can be on the water? My trip of paddling in Alaska with Freya has finally started. I decided to join her long time ago, last Autumn, when it seemed like a great idea and like something that was far far away. And really it still seemed far away even when Michal was already covering miles along the south and later north of the Alaskan peninsula. Then suddenly it was time to get to the airport and go. The first noticeable thing about my trip was that the planes were getting smaller and smaller as I progressed from London to here. The last smallest plane is still however waiting for us on a wind swept runway in Cold Bay. It’s too windy and small planes don’t fly in this weather. So as we are waiting for the break in the wind, I’ve been entertaining myself looking around the village. Actually it is called a city, and probably once was by local standards, with about 100 people living here. It has a shop, a hotel, a bar, a library, school which is long shut. The town is fairly new, established during the WWII as a military base, it has no major industry. However there was some excitement to see at the ferry port, as the ferry comes every 2 weeks. The flowers frantically waving in the wind made it clear that it still was the summer. I had a chance to see a bear, hopefully the only one that I would see while here. It’s getting more and more interesting. The last two days especially. Yesterday we decided to round the most westerly point and have a look at the most westerly lighthouse of Europe. 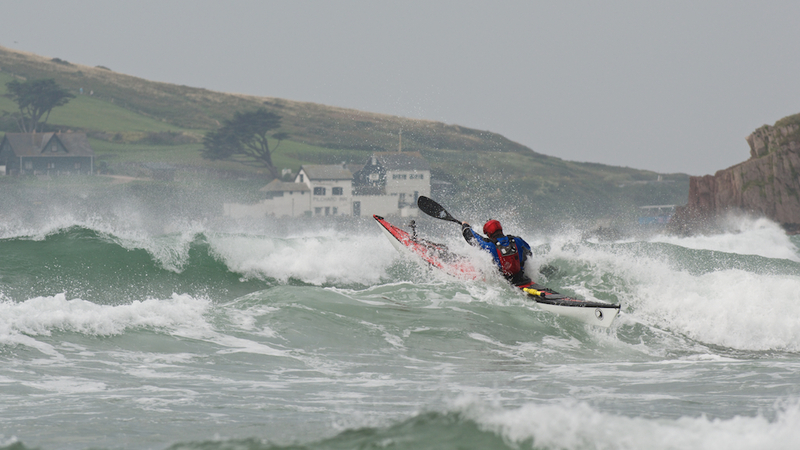 What started as a leisury sunny paddle across a bay past long sandy beach resulted into something, what I can summarise into the following: rolling big southwesterly swell against strong northerly wind, and tide that was doing who knows what. 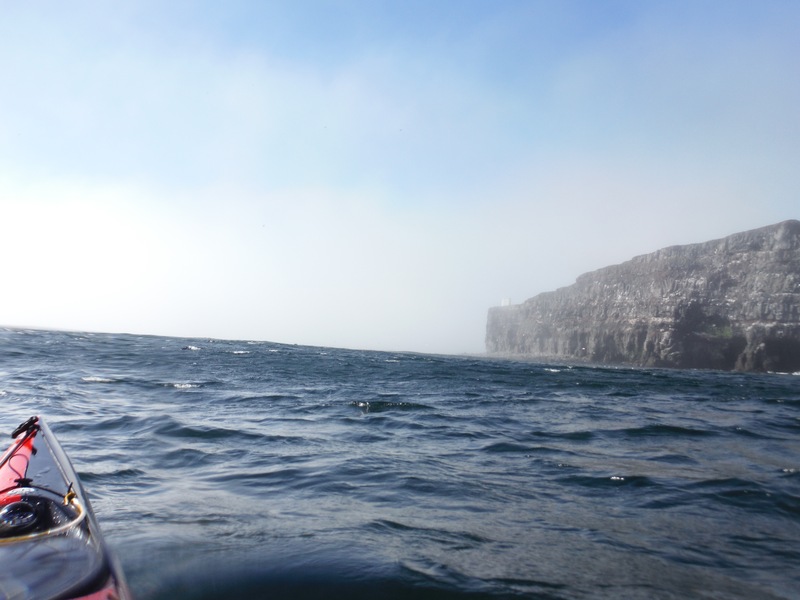 Fortunately we could see none of it too well as in the same moment the fog descended and left us with 100 metres visibility.Just before we also met some bird watchers on a small boat, when they heard we were going round the west corner they told us about the race, and yachts going backwards there. All in all we managed and landed on a minor surf beach. 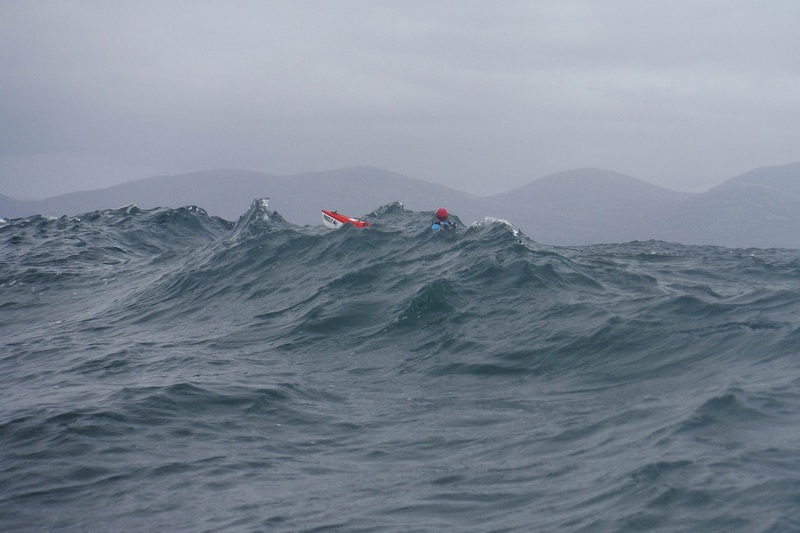 Today we set off for a shorter paddle as we decided against any crossings into forecasted headwind. 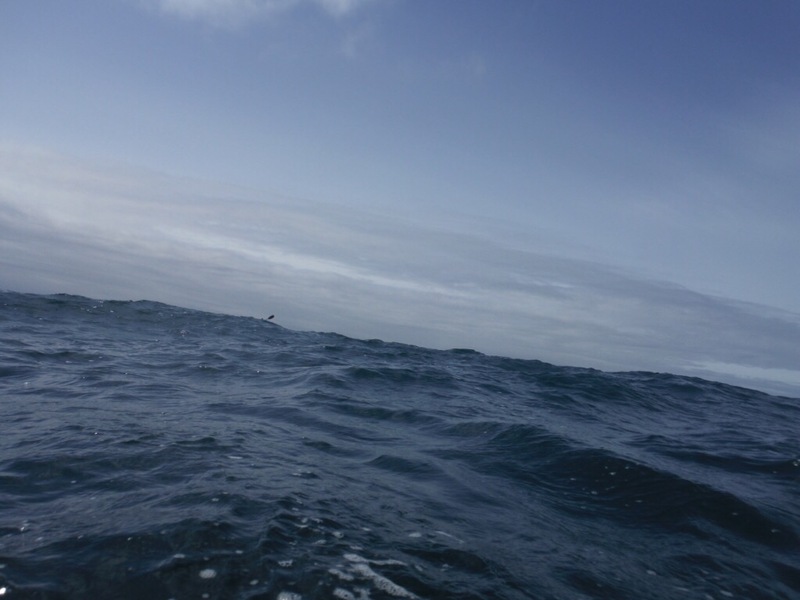 When it started, we decided not to land in a particularly surfy bay, but see what’s round the corner. 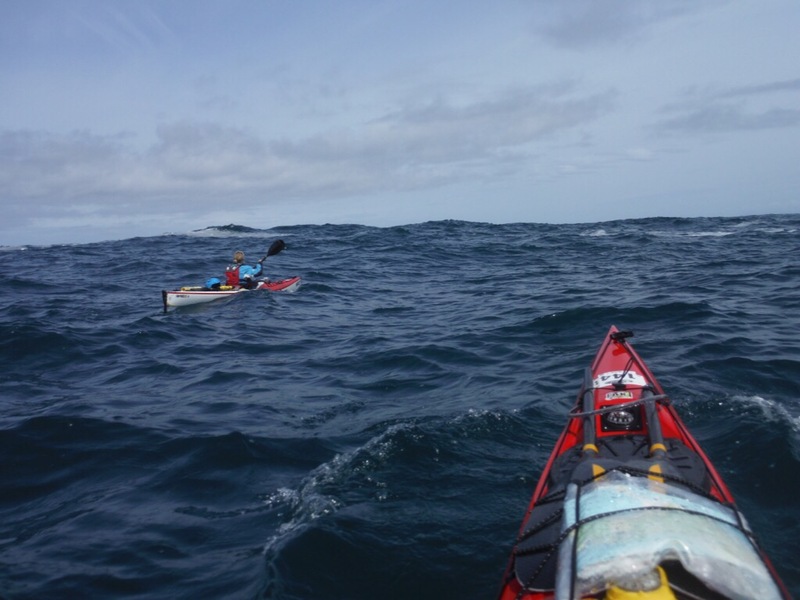 And then we were paddling against headwind force five and against waves that I can only describe as huge-hugely-huge with small breaking tops. Wasn’t that just fun! Sadly it was beyond us taking the camera out. And just as we were almost out of it, a fishing boat passed us quite close. I decided to demonstrate that we are someone, who negotiates these every day, and waved. So did this fisherman, and also took it, that we were ok, which we were. Only then sped off full blast, so this hugely huge waves with small breaking tops were joined by fast approaching big surf waves of his wake. When it all calmed and we looked around, we almost felt that we got lost. 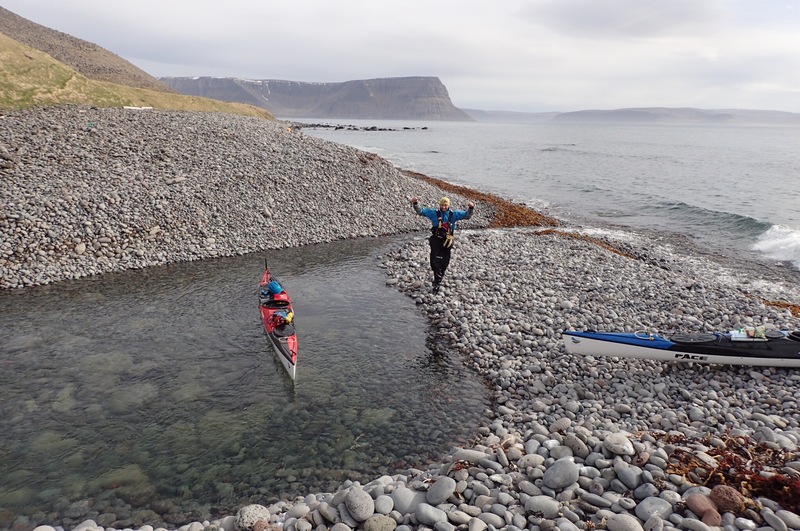 There wasn’t any small sheltered bay, but the Patreksfjordur, the same one against which crossing we decided earlier. Oh well, we crossed it then, and found amazing campsite with our own cold pool. And many old ruins. We saw old ruins in all our three previous campsites. 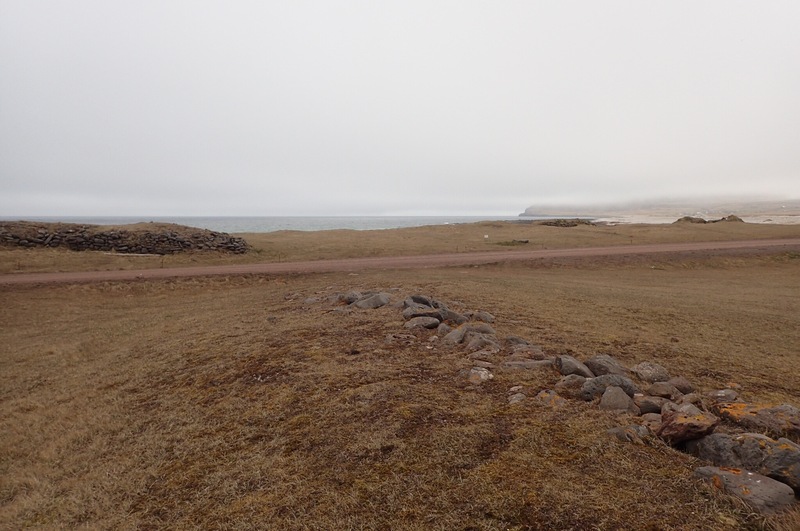 They were remains of old farms and former summer fishing stations. For example the one from yesterday, Brunnar, was an ancient fishing station used till 1620, and then as season station till 1880. It has been two weeks now since we came back from Scotland, and finally we had the time to go through all photos from our trip. It’s interesting, how some pictures can bring up memories of the moment in which they were taken. Here are few to share. Already when we were crossing to South Uist, we knew a storm would come during the night. We aimed at the Uisinish Bothy. 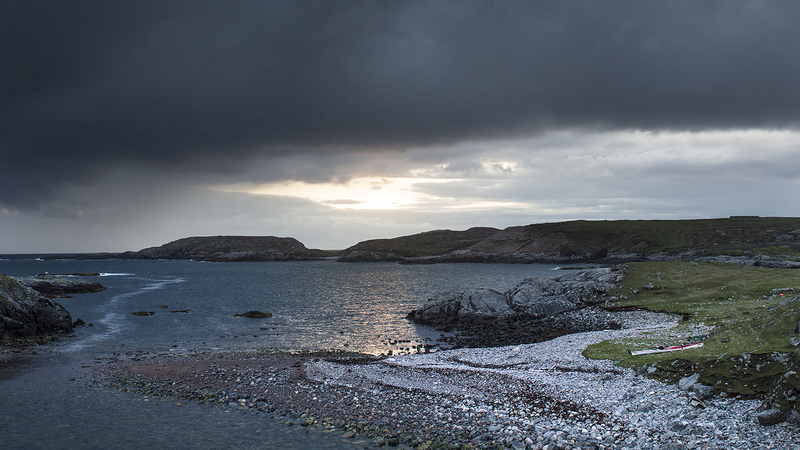 In the next few days we had first chance to experience what the weather on Outer Hebrides may look like. This photo captures the moment when we were going to put more boulders on our kayaks to ensure they won’t be blown away in imminent force 9. 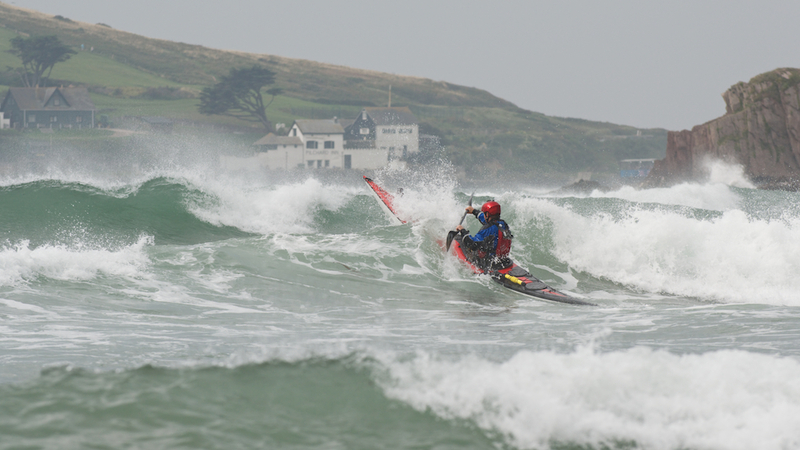 We paddled for six or seven hours in a big variety of conditions and ended up paddling into increasing headwind and rain. Shortly after we landed and managed to put our tent up a car stopped by. We were offered freshly prepared crab and selection of cakes. Including coffe and walnut one! What a perfect finish to paddling day. Have we mentioned the weather yet? This was the beginning of summer half term in England and Natalie finally got the snow she was talking about all winter. We were looking for somewhere to pitch our tent for the next few nights. there wasn’t much land suitable. Until we spotted this flat patch of grass, which promised some privacy from dog walkers. Who cared it was in plain view of the whole village of Port Ness. This photo was taken at midnight. When we were crossing from Hirta to Boreray the sea was smooth with swell like rolling carpet underneath. The sea and space were so huge that these stacks looked like mere boulders rather than the two hundreds meters high rocks, they were. 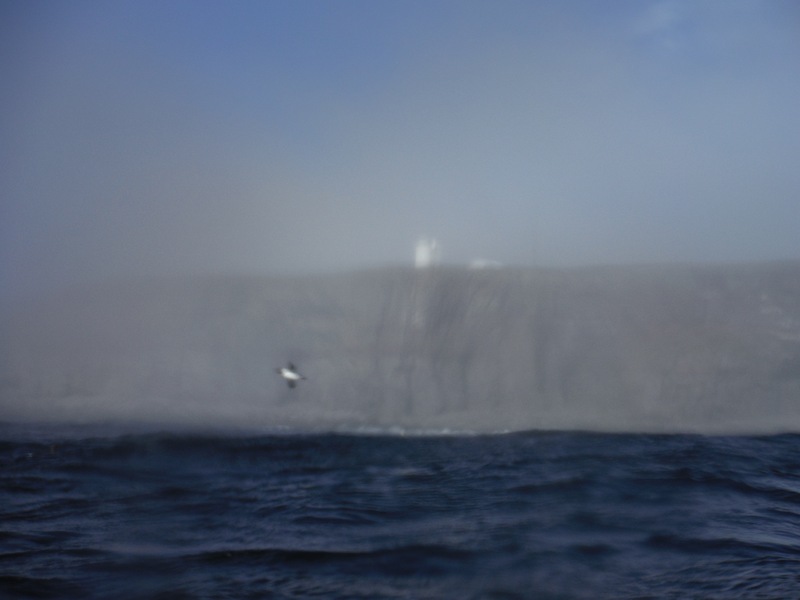 As we were approaching Boreray the loudness of the sea was deafened by the cacophony of the birds. With every meter we came closer the sound of the gannets’ wings slicing through the air got louder and louder. There were moments, when we thought that the tent would have it, as it often seemed that someone was throwing buckets of gravel on it. Yet, after each episode we were rewarded by spectacular displays of nature’s art. At one point, while following he coast of this beatiful island, Natalie decided to claim it her own. She scribbled her initial there for everybody to know. After a while we got used to the size of the swell. If we thought we paddled in big swell before, here it was much bigger. Several times we were given the chance to have birds view of each other. When the waves hit the cliffs the sea became, even more spectacular and added special features to its repertoire. We landed in Uig Bay hopeful that the weather would finally give in and we could try to catch up with our original plan. Although this never happened, we spent several nights there being entertained by its people, landscape and weather. This is the moment when I realised how fortunate I am. I was paddling into the sunset. The sea had an atmosphere. I was heading into an iconic location. The time was incredible. And at that point I started to think, what else could one wish for. Then I realised, it was to be able to share this with your most closest and loved one. And here I was, paddling into the sunset with my wife. Five days, five days we have sat on the land. So far the most weather bound we have been on all of our paddles. We enjoyed exploring North Uist making various trip, a combination of walking, hitching and local buses taking along the circular road. We met lots of people, found out many interesting facts, learnt a thing or two about birds. Yet, we are here to paddle, and paddle we did yesterday. The wind dropped from red, orange on XCWeather to green for about 12 hours and we knew that this was our chance. On long journeys we learnt to go with the weather and the flow. This time, we had to add a new skill, to go with the wind as well. And so instead of heading west or north, we allowed us to be pushed east. 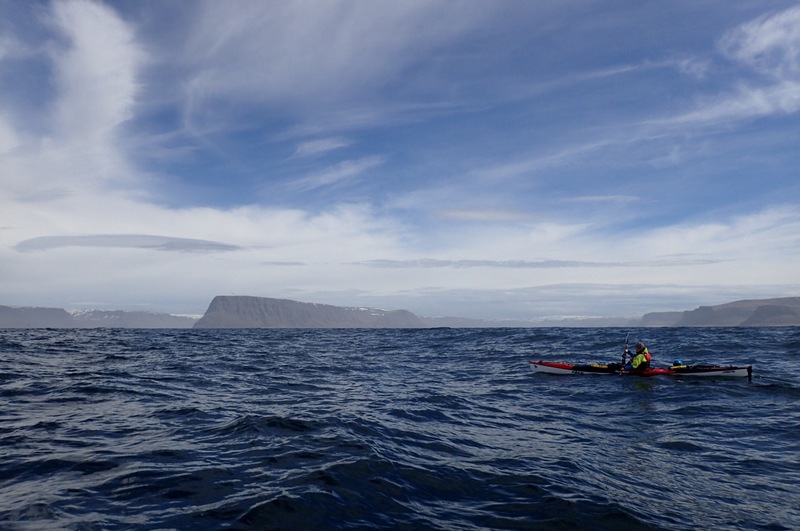 Once we left the bay from Hugharry, the sea changed from calm, clear turquoise to lively, dark and quite hilly. 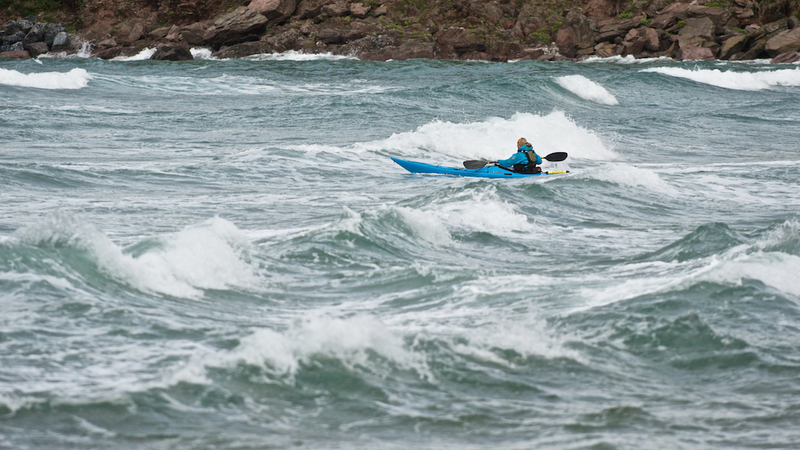 We forgot how it feels to paddle with this great Atlantic swell. We stayed far out away from land, whose cliff or hills occasionally disappeared from view obstructed by waves. We enjoyed the conditions, more so, that we could regularly see each other from the bird perspective. We landed just once for an obligatory pee stop at the entrance between islands of Harris sound. 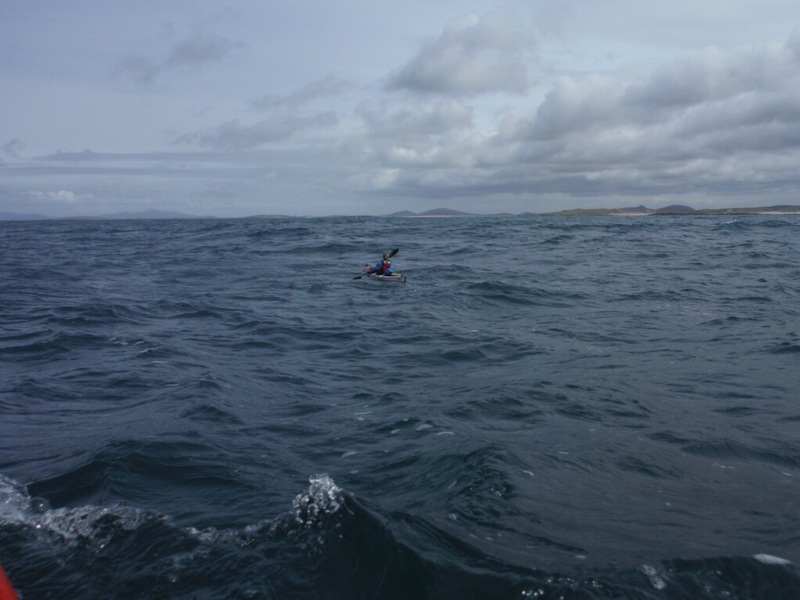 The sea calmed straight a way and with wind blowing in our backs we decided to circumnavigate Berneray from the north rather than ferry the kayaks across the causeway. Berneray is appreciated by tourist for its dunes and long white beaches, something that could get quite boring if followed for a prolong period of time in the kayak. Fortunately the island of Borneray, Pabbay and Harris made the views more varied. 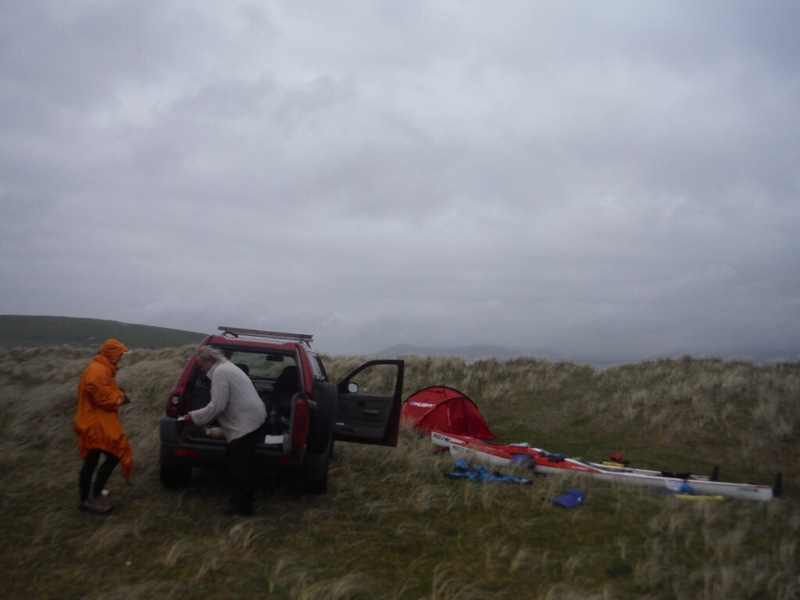 Six hours after launching we landed on the east side of the island and decided to camp in a place in dunes,which will provide us with enough shelter for the forthcoming gales tomorrow. We chose the right spot, obviously, as little later a car stopped by, instead of being bothered by landowner it was the best take-away ever. 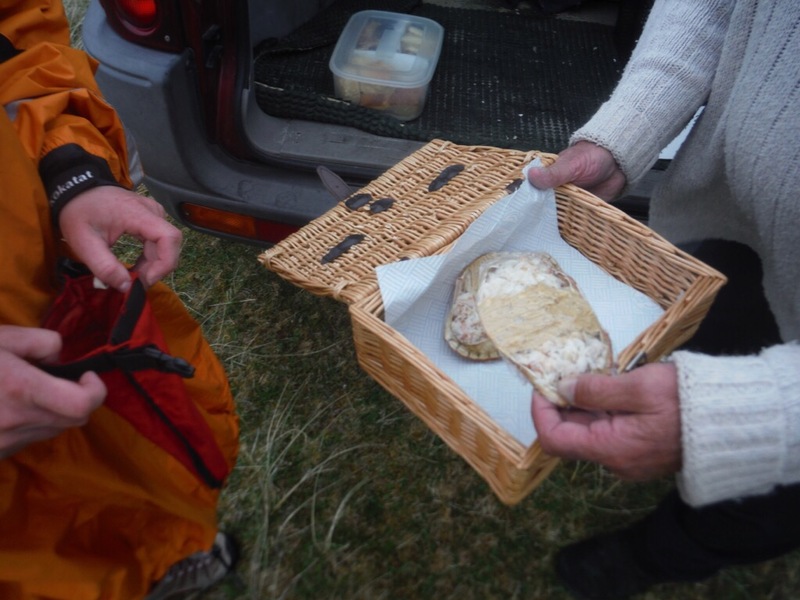 With shouts of “home baking”, “local crab”, we purchased the latter and coconut, and coffee and walnut cake. To all our friends, visitors and readers of our blog, we wish you Happy New Year 2015 with lots of great adventures. Here is a card from Toby with lighthouses to keep us all pointing to the right direction. We will share the answers in the new year. At the end of this summer we visited Bantham beach three times. It is a great surf spot which delivers some form of fun in almost any weather. And don’t forget to pay a visit to Gastrobus, the real highlight.